It is only by the truth found in Christ that we are begotten of Him. This truth Paul knew and in a vision was told not to hold his peace for God was with him in Corinth and he preached there a year and six months. (Acts 18:5-11). And when Silas and Timotheus were come from Macedonia, Paul was pressed in the spirit, and testified to the Jews that Jesus was Christ. And when they opposed themselves, and blasphemed, he shook his raiment, and said unto them, Your blood be upon your own heads; I am clean; from henceforth I will go unto the Gentiles. And he departed thence, and entered into a certain man’s house, named Justus, one that worshipped God, whose house joined hard to the synagogue. And Crispus, the chief ruler of the synagogue, believed on the Lord with all his house; and many of the Corinthians hearing believed, and were baptized. Then spake the Lord to Paul in the night by a vision, Be not afraid, but speak, and hold not thy peace: For I am with thee, and no man shall set on thee to hurt thee: for I have much people in this city. And he continued there a year and six months, teaching the word of God among them. The truth of the Lord is straight from the Spirit which He has sent to all who repent and do the will of God. It is the Spirit that will glorify Christ as we speak on His behalf. (John 16:13-16). 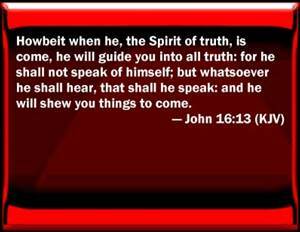 Howbeit when he, the Spirit of truth, is come, he will guide you into all truth: for he shall not speak of himself; but whatsoever he shall hear, that shall he speak: and he will shew you things to come. He shall glorify me: for he shall receive of mine, and shall shew it unto you. All things that the Father hath are mine: therefore said I, that he shall take of mine, and shall shew it unto you. A little while, and ye shall not see me: and again, a little while, and ye shall see me, because I go to the Father. God feels very strongly about His eternal Spirit given, wherefore all manner of sins can be forgiven unto us….. Yet if anyone blasphemes against the Holy Spirit will have no forgiveness and is even in danger of eternal damnation. (Mark 3:28-29). Verily I say unto you, All sins shall be forgiven unto the sons of men, and blasphemies wherewith soever they shall blaspheme: But he that shall blaspheme against the Holy Ghost hath never forgiveness, but is in danger of eternal damnation.